The goblin. The stinking goblin. The fat, stinking goblin. Sidisi sat, slumped in her throne, head bare, crown gone—taken right off her head by the accursed goblin. There was little else she had been able to think about in the past few months except for the goblin and what she would do to him and his clan when she got a hold of them. It had become an obsession. One by one, her most trusted advisors had warned her against the course of blind revenge, and one by one they had met their fate at the maw of the Mother Crocodile at the center of the Kheru Temple pit. "Jhinu," Sidisi hissed. "I am hungry. Bring me my food." The crown had once been taken by Sidisi herself, off of the freshly severed head of the previous khan. Like all Sultai khans, she had proven her abilities of trickery and ruthlessness, and created her own destiny. When she dropped his lifeless body into the pits, it was the sign to all other comers at the throne that a similar fate would befall them. The purge of her potential rivals in her first years as khan had left all other challengers afraid to do anything but bow to her, leading to a golden age of calm in Sultai politics. Now, however, the courts at Kheru Temple were uncharacteristically quiet, and it was unclear if the nobles and merchants who usually made up its halls were afraid of Sidisi's famous temper, raising armies of their own to take the throne from her, or simply dead. She had fed so many to the pits. Oh so many. "My queen," a gaunt, balding man said, bowing as he led an armless Sibsig with a bowl of fruit attached to its head. "I hope this is of your pleasing." Jhinu had been part of the merchant class, from one of the wealthiest families in the entire Sultai Empire. In an attempt to curry favor, and to get a monopoly on the Niraj River tax collection duties, he delivered to Sidisi the heads of three goblins he claimed to have been the culprits of the sinister act. 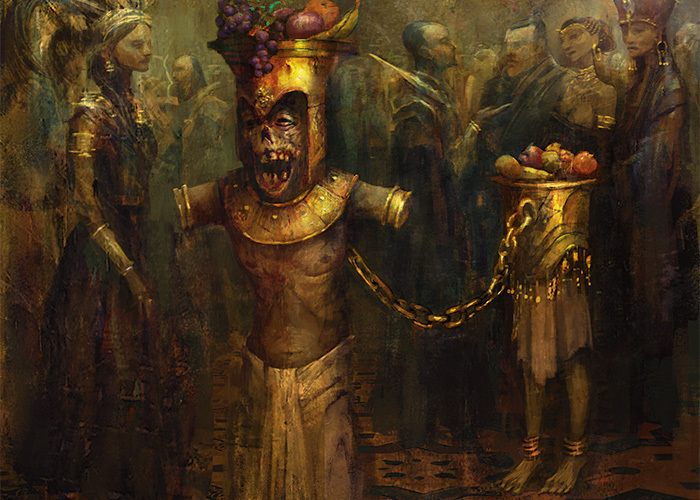 The ape knew nothing of the Rakshasa magic or that, to the Queen of the Sultai, the dead's lips are as easily moved as those of the living. The three goblins knew nothing of her crown—they were deserters who drowned in an attempt to cross the Niraj, looking to scavenge food from the farms on the far side. Trickery and deception was expected in politics, but there was a high price to getting caught. She kept him alive as a reminder to all that there were fates worse than death. "Tell me, Jhinu," Sidisi said, putting a grape in her mouth and swallowing it whole. "It has been some time since one of your relatives has come to bargain for your life. Do they no longer care about you, or are there none left?" "They…they are afraid, my queen." Jhinu said. "They do not wish to displease you with offers not worthy of your magnificence"
Sidisi picked through the fruit, throwing the pieces she had no desire to eat onto the floor. "And what happened to the last relative who brought gold and jewels?" 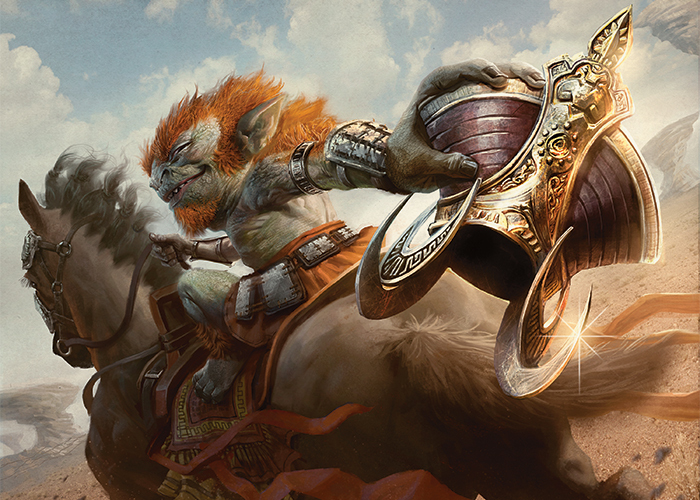 Jhinu looked toward a Sibsig chained to a pillar on the left of the room, holding up a Sultai banner." "Do you have no more brothers?" Sidisi asked. "I could've sworn you had at least two brothers." Jhinu looked at the Sibsig that he had brought into the room. "Oh yes," Sidisi said. "I thought I had put him near the mandrill cages." "My cousin," Jhinu said. "My cousin was the one you had guarding the cages." "Well," Sidisi said, picking up a grape and putting it in her mouth, "If nobody is left who would barter for your life, maybe you are worthless. Perhaps I should be done with you then. Give you to the pits." "No, no, my queen!" Jhinu said, prostrating himself on the floor in front of her. "I am sorry. I have other family. I will send more messages. I am sure someone else will come to barter for me." "See that they do," Sidisi said. "With the raising of my army, we have been sending so many fewer people to the pits. A worm like you is not fit for a second skin." "I…I am sorry," Jhinu said again, backing away from the khan. "Please…please. I have recruits for you to inspect." Sidisi motioned for him to bring them to her. 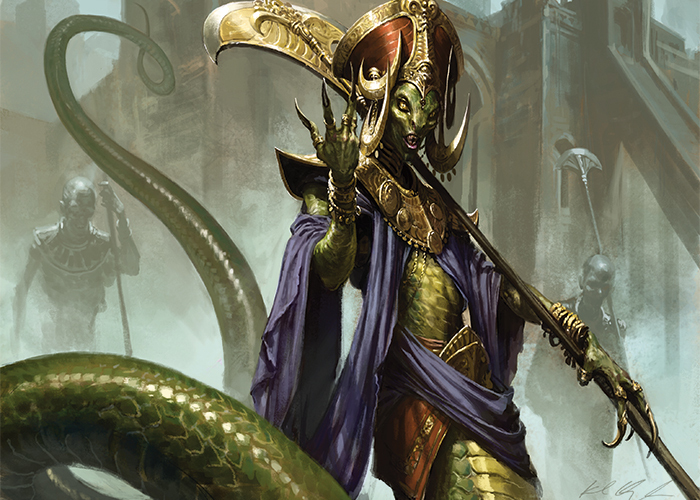 In raising her army, she had requested that all of the Sultai provinces provide five percent of their population to be enlisted into Sidisi's army. The provinces sent first their unwanted, criminals, and destitute, many of which were hardly fit to feed to the crocodile pits, let alone be the front line in the greatest Sulati army in a millennium. To show her displeasure at the level tribute, Sidisi had sent out a second request—this time for the eldest born of each family. While this request had been unpopular, Rakshasa emissaries sent to the provinces who were not compliant quickly quelled any risk of an uprising. From this crop, Sidisi had requested that the strongest be sent in for her personal inspection. The best of these would be her personal guard—undead warriors strong enough to guard her from incursions like the one she had suffered at the hands of those wretched goblins. "Allow me to present the contingent from the Niraj province," Jhinu said. Sidisi inspected the recruits from her throne. They were strong warriors, in the prime of their lives. Their second skins would be free of the defects that the lesser Sibsig were born with—weak knees, weak shoulders, teeth unable to rip the flesh from bones. "Hold. What is this morsel?" Sidisi said, pausing as she made it halfway through the recruits. In the back was a youth, no more than thirteen years old. "This is a joke of yours, Jhinu? I thought you inspected this crop yourself." "I assure you, my queen," Jhinu said, "these are all strong warriors. They will serve you well." Sidisi whipped her tail angrily, knocking the bowl of fruit, along with the Sibsig's head, onto the palace floor. "Do not toy with me, ape. I know this is your home province, and I will not show them leniency by allowing them to send me such children." "My queen," Jhinu said, kneeling to the floor. If you inspect the youth yourself, I assure you, you will find he is as strong as any other man here." Sidisi left her throne and approached Jhinu. "I know you have relatives left, and if not them, then friends and business associates. Disobey me again, and I will scour the empire clean of not just you, but everyone you have ever known, and your name will never be spoken again." Jhinu lifted his head and nodded once. From the corner of her eye, Sidisi saw the youth hesitate for half a second, then bounded at the queen. He was unfettered—his shackles attached to nothing at all, just a ruse. His speed was rarely seen in these apes, almost snakelike. Likely the boy had come from the Jeskai, either by force or as a willing participant in the plot. The pause had given Sidisi a moment to react, and with preternatural speed, her tail grabbed Jhinu by the leg and threw him into the youth. He screamed as they tumbled across the marble floor of the palace. The youth attempted to regain his footing, but found the queen's tail around his neck. He reached for the dagger but found it out of his grasp. On the floor, Jhinu gasped for air, black streaks quickly moving across his skin from where the dagger had scraped him in the tumble. Sidisi recognized the poison. It was known as Silumgar's Breath, made from the distilled essence of hundreds of orchid stems that bloomed only once a decade in the heart of the Objung Swamps. The poison was as rare and expensive as it was potent. Painful, slow, and totally incurable. A single scratch would have been more than enough to kill her over the course of several days or weeks as she rotted away from the inside. This was a personal attack. "You were right, Jhinu," Sidisi said, cracking the neck of the youth and tossing him to the ground. "That one was strong. He will make a worthy addition to my guard." "I…" Jhinu said, writhing in pain. "I won't let you beat me. I will make you pay for what you've done to me and my family." "I gave you too little credit," she said, running her tail across Jhinu's sweaty, convulsing brow. "I thought you a helpless fool, but I was only partly right. Still, you reminded me of something—I have become too lax." Sidisi picked up the dagger and thrust it squarely into Jhinu's chest. "As much pleasure I would get from watching you writhe in agony for the next few days, it is a mistake I won't make again." Sidisi returned to her throne, her head held high now, reminded again of her purpose. Reminded again of the greatness of the dragons, and the ruthlessness that had for so long made them the rulers of this world. Allowing Jhinu to live just to watch him suffer was a form of mercy in disguise. Mercy, the greatest sin of all sins, had almost cost Sidisi her life. It was an emotion that even in its barest form, she would never show again. If the goblin had been armed with spear or arrow, it's possible that it could've struck a mortal blow. Fortunately for Sidisi, the Mardu love war more than they love victory. Sidisi knew that her army was not yet close to being complete. She needed to raise an army the likes of which had not been seen since the time of Tasigur. An army of Sibsig that would cover the entire steppe and march tirelessly on the Mardu until their horses died of exhaustion. And one by one, she would kill every encampment she could find, raising the dead by herself if need be, so that they could join the unyielding march on their brethren. Soon, the great orc Zurgo himself would adorn her palace as her greatest prize. Perhaps she would turn him into a serving tray, or maybe a chair. 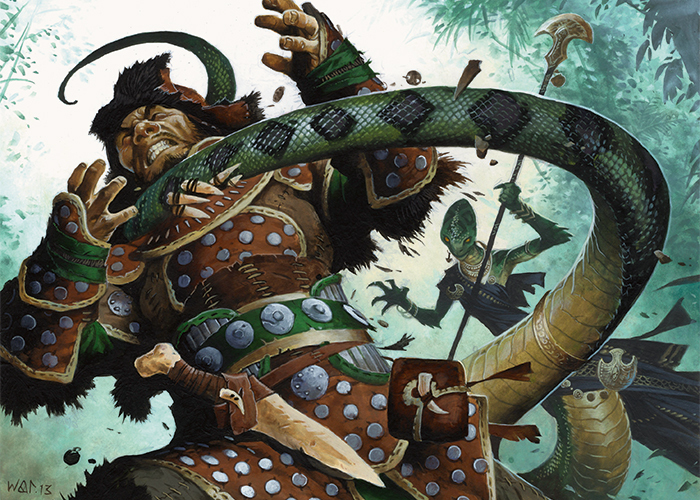 Find more official Magic fiction on the Uncharted Realms page.